Though it’s been several years, I still remember my first experience with Indian food—the colorful bowls of roasted meat, wafting spices in the air, and a spoonful of tender vegetable dumplings flavored with exotic touches of cashews, cardamom and coriander. At Monsoon in Mount Laurel, I was able to recapture that initial feeling of wonder. Chef Premnath Motiran brings fine Indian cuisine to South Jersey after many years of cooking abroad, from Budapest and Mumbai, Hong Kong to L.A. It had been some years since South Jersey Magazine visited Monsoon, but we were pleased to see the chef’s capability has not diminished. Outside, white columns, a courtyard fountain and arched Moorish windows invite guests in to a space that feels more elegant and chic than you’d expect for a suburban restaurant. Inside, a soaring ceiling and select art pieces of carved dark wood and bronze add to the curated atmosphere. Tables are spaced far enough that a quiet conversation isn’t difficult to have, but so that whenever a neighboring table receives a dish, you can’t help but take a peek. During the week, the far wall is host to a popular lunchtime buffet that attracts busy professionals. The menu is simple, with roughly a dozen curried delights of chicken, lamb and seafood, and an equal number of unique vegetarian entrees, leaning heavily on fresh vegetables, legumes and paneer cheese. A wide selection of breads—variations of leavened white flour naan and deeper wheat flour roti—are well worth your time, though it will be hard to share. Keema naan is a much larger and heavier version of the flat bread, stuffed with spiced lamb and cut into wedges. Its simpler but more addicting cousin, lasooni naan is smothered in garlic, oil and herbs. The latter arrived at the table still warm and soft from the oven, with enticing char marks throughout—ready to be dipped into my entree’s curried sauces. Among the appetizers, onion bhajia are a crisp tangle of battered onion, spinach and spices in with a powerful turmeric orange-yellow hue—great for snacking, though the fritters were heavy with oil and overpowered by the batter. Tandoor entrees are blasted in the kitchen’s clay oven, making for a dramatic presentation tableside. Our selection of badami kabab came sizzling to the table with onions and peppers atop a hot iron dish, removed from the skewer that held the chicken through its brief roasting. The tender breast meat emanated flavors of garlic, herbs and slivered almonds, and was among the favorites of the night. Chicken tikka masala is one of those dishes you can use as a benchmark for most Indian restaurants; it’s a widely-known preparation that, though originating from the Punjab region of the world, is accessible and adaptable enough for palates of all types. 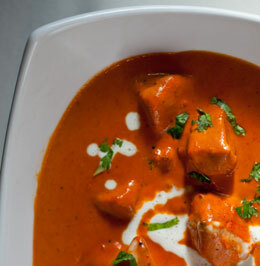 Chunks of chicken breast are marinated, roasted in the tandoor and elegantly served in a large bowl, swimming in a deep red-orange spiced masala sauce. The widely popular dish—sometimes spicy, sometimes mild—is more sedated here, with a sauce that feels more sweet and yogurt-based, though no less flavorful. Surprisingly, the malai kofta made my mouth tingle the most, singing with unexpected heat in the back of the throat. The soft vegetable spheres, like a vegetarian version of mom’s meatballs, are not always found on the menu at many Indian restaurants, but they’re a real treat if you can find them. Stuffed with fresh basil and herbs, the kofta are bold and nutty, enveloped in a carrot-colored sauce that begins with a hint of yogurt and ends with a slow-building tang. Though I fondly remember this dish that initiated me into Indian cuisine, Motiran’s version is now my favorite. My dining partner and I looked at each other, knowingly, once the final plates had been settled. Between the large bowls of curry, baskets of naan and fragrant long-grain basmati rice (the standard accompaniment), clearly we’d ordered too much. That’s easy to do when servers seem to parade sizzling dishes throughout the dining room every few minutes. And I do recommend ordering more than your fill; the leftovers, carefully packaged, were just as wonderful the next day. The small selections of authentic desserts are house-made and feature plenty of spices, fresh fruit and nuts—like gulab jamun, deep-fried milk and flour droplets soaked in warm, floral rosewater syrup, infused with cardamom seeds. Here, it’s worth branching out to the unknown. What chef Motiran has creating is not just a collection of well-crafted sauces and authentic Indian cuisine; it’s an experience—one worth returning to more than once.